"Game Night," about game-loving partiers who get drawn into a web of danger, is a raucously funny film that has a knack for going right up to the edge of nastiness. Written by Mark Perez and directed by John Francis Daley and Jonathan Goldstein—who cowrote "Horrible Bosses" and "The Incredible Burt Wonderstone" and helmed the 2015 "Vacation"—it starts out borderline ludicrous and keeps piling on improbabilities, until it leaves our world behind and become an exercise in absurdity. The main couple, Max and Annie (Jason Bateman and Rachel McAdams), hosts a regular game night at their suburban home. A cleverly-edited opening montage shows that games like Pictionary, Scrabble and charades are the foundation of their relationship and led to their marriage. 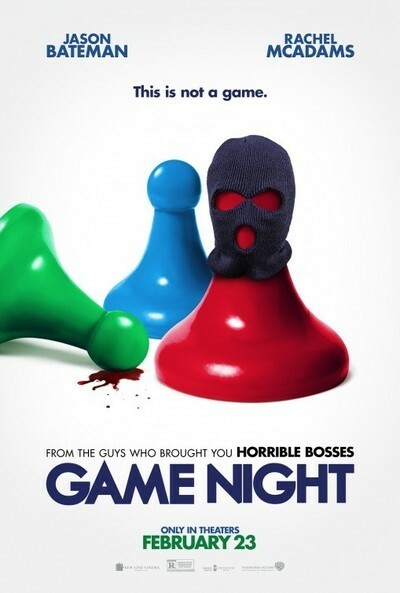 The game night covered in this movie includes Ryan (Billy Magnussen), a dimwitted friend of Annie's; Sarah (Sharon Horgan), Ryan's much smarter date; the husband-wife team of Kevin and Michelle (Lamorne Morris and Kylie Bunbury); and Max's estranged brother Brooks (Kyle Chandler), who's a success in ways that Max can only dream about. Then Brooks invites the guests out to his rich-guy house for a different kind of game night, modeled on those murder mystery dinner parties that became a fad a few years ago, and "Game Night" becomes a roller coaster ride, whisking the audience through broad slapstick, deadpan exchanges and imminent threats that sometimes erupt into mayhem. Brooks gets kidnapped in a home invasion that everybody else assumes is just part of the game, and threatened with murder if the others don't deliver a precious Faberge egg to a scary-voiced mastermind who's giving them orders from afar. The rest of the team splits up into pairs and tries to solve the mystery in their own way, their paths periodically re-crossing, only to diverge again. If you've seen "The Game" or other films in which an escapist adventure turns weird and frightening, you'll anticipate some but not all of the twists and turns of "Game Night," and you'll appreciate the way that the screenwriter and directors tie them to the psychology of the characters, and structure the film as a journey of personal as well as narrative discovery. The brothers' mutual resentment and rivalry is nearly as important here as it was in "The Game." Max and Annie's inability to conceive a child comes into play as well, as do the psychologies and pasts of other game night participants. A subplot about Kevin's obsession with figuring out whether Michelle was ever unfaithful to him has a terrific payoff that flips over on itself. There are juicy bits for supporting players as well, including Jeffrey Wright as an FBI agent, Danny Huston as a decadent rotter (his specialty), Michael C. Hall as a scary criminal known as The Bulgarian, and Jesse Plemons as the divorced and seemingly personality-free cop who lives in the same cul-de-sac as Max and Annie and seems obsessed with getting invited to game night again. None of these characters are quite as they appear on first or second glance. "Game Night" is a nearly perfect entertainment for adults over a certain age. There's a madcap car chase, a violent incident that leads to impromptu surgery, and a house party with echoes of the masked spectacle in "Eyes Wide Shut," but it's all entwined with commentary about aging, disappointment, doomed romanticism and sibling rivalry. The actors put it all across with flair—especially Bateman and McAdams, who complete each other's thoughts so gracefully that they really do seem as if they've been married forever, and Plemons, who steals every scene he's in through deft underplaying. And while there are a few touching moments, the film never tries to claim sentimental or revelatory power it hasn't earned. Control of tone is essential in any film that doesn't adhere to a familiar formula, and luckily for the audience, Daley and Goldstein are on top of things. They've got a knack for figuring how far is too far, pushing right up to the border, then stopping with one toe over the line. The understated cartoonishness, anchored in Bateman and McAdams' teamwork, helps a lot. Characters keep sustaining physical injuries that would kill or incapacitate people in reality, only to bounce back and resume the game, but their mishaps are calibrated so that they just seem to smack a bit of sense into them, like an exploding cigar or an anvil on the head in a Bugs Bunny short. This is one of the best surprises of a still-young movie year: a comedy that takes nothing seriously except fun.